City of Demons #2 features lots o' blood. Si Spencer's Hellblazer: City of Demons #2 should come with a note on the cover that reads, "No real animals were actually harmed during the creation of this comic book." Graphic scenes by Sean Murphy continue in the bloody comic of the day. The second issue in this Hellblazer mini series starts to let the reader in on what the series is about. 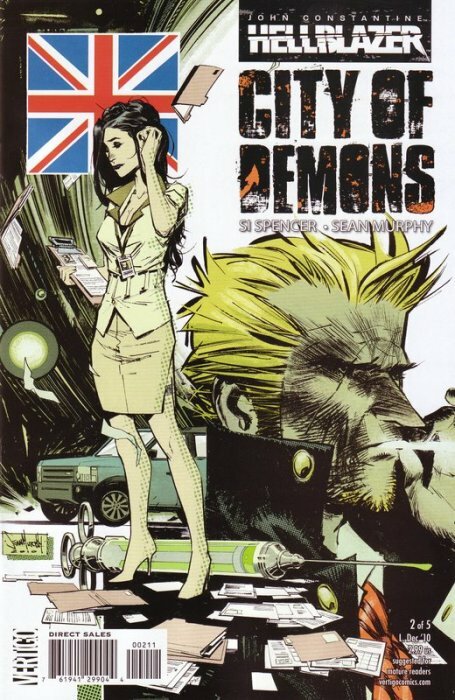 Coming off of the first Hellblazer: City of Demons issue, I was unclear on the direction of Spencer's story; but now, I see it has turned into a thriller about how John Constantine can solve this unknown spread of violence which has surrounded him in London. Murphy's art continues to impress, especially through his depictions violence. As implied previously, there are some panels which include a kitty and doggy badly injured. This is not a comic for children unless they are tough kids from the streets or future serial killers which I believe are prone to animal torture and killing when they are young. That made me sad to think about.